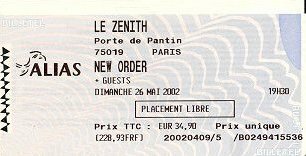 New Order were back a third time within the space of a few months, to play the Zénith, which is the second largest venue in Paris. I had slightly shortened my holidays to be able to see them and was happy that my sister could join. Again the band was introduced by Alan Wise - "Welcome the four guys from Macclesfield" - the line up was the same as in 2001 and the opener "Crystal". Hooky was already dancing with his bass like a japanese samurai. Bernard told us that they had not toured for the last few months, and that made the gig at the same time refreshing, hectic, and a little chaotic on one or two occasions! They played "Transmission" - once again Steve's drumming was out of this world - "Regret" and "Ceremony" : New Order were showing all the required vitality and strength in that song. It was followed by "60 Miles An Hour" - I was just starting to fear that they would play the exact same set list as in 2001... - and "Atmosphere", with the rhythmic section at its best. Then they sang "Brutal", "Close Range" and Joy Division's "She's Lost Control" with a few introductory words from Bernard - "I think we never played it in Paris since the Bains Douches" - which raised a wild roar in the audience. The song was absolutely grand and was in itself worth shortened holidays! Next were an excellent "Bizarre Love Triangle" (and Hooky), "True Faith" in the same vein as last year's, and "Temptation", another stunner with Bernard as impressive as he can ever be. They finished with "Love Will Tear Us Apart", but Peter had some problems with his bass amp, and Phil had to play the bass line on keyboards. Hooky, helped by his roadies, could fix the problem and then he kept on playing all by himself when the others had left. New Order were back for an encore and dedicated the next song to Joy Division's fans as they played the first notes to "Digital"! "Rock The Shack" followed, and then "Blue Monday", with a wonderful Hooky on bass and drum kit. As usual, he was the last one to leave the stage. The guys were back for another encore, which was meant to be made of 2 songs. They played "Your Silent Face", but in the middle of the song the bass amp broke down again. Bernard kindly smiled at Peter and hugged him, the technicians tried their best, but nothing could be done, and Hooky got himself a drink and sat on his corner, and even offered a drink to some lucky fellow in the audience. Then they were all gone for good, after a gig which had lasted an hour and fourty five minutes!